THE ONLY PLANT OF ITS KIND IN THE WORLD! Thymus x citriodorus The high citronella oil content of this hardy, easy-to-grow perennial plant is more potent than any other mosquito repellent plant tested Hardy in zones 3-10 The plant you will receive is growing in a 3" pot. The Ultimate No-Spray Mosquito Repellent Combats Mosquito Problems Safely This relative of the thyme family has a pleasant lemony fragrance that scents the air with a perfume mosquitoes cannot tolerate. The high citronella oil content of this hardy, easy-to-grow perennial plant is more potent than any other mosquito repellent plant tested, and more potent than citronella candles or sprays, especially when the leaves are rubbed onto exposed areas of bare skin. 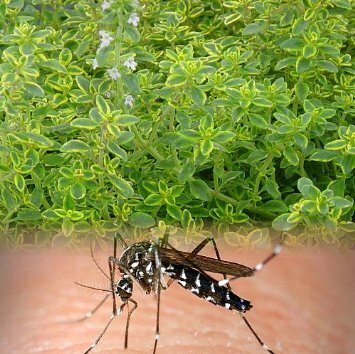 Reported by plant scientists at a major university, and published in major national magazine media, the mosquitorepellent thyme is up to three times more effective at repelling mosquitoes than other mosquito-repellent plants. Mosquito repellent thyme is used as a garnish or cooking herb; the lemony scent of the herb makes it a great addition or flavoring foods for a citrus scent. The plants are easily grown and spread fast making an attractive low growing 4 tall ground cover with a mass of light violet flowers. Plants will grow successfully in zones 3-10. Also makes a great houseplant in a sunny window! The plant you will receive is growing in a 3" pot.